Nymphs are flies designed to imitate the sub-surface food of trout. 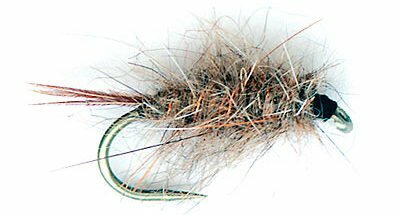 For a description and list of nymph flies see below. Nymphs are flies designed to imitate the sub-surface food of trout. Mayflies, their lava stage, in particular, are a very important food source for trout. The adult mayfly lays her eggs on the surface of the water. The eggs sink to the bottom. Two to three weeks later hatch into very small nymphs. Depending on the mayfly species they remain in this larval nymph stage from as little as a few months to over a year. As they get closer to maturing into flying insects the nymphs darken in colour as their wings and new bodies form. Finally, they rise to the surface with the aid of air trapped in their now no longer needed disposable cuticle, or as is the case with some species crawl out of the water, spread their wings and take to the air. For the sake of simplicity, I have also including things like Glo-bugs in this category which imitate fish eggs as they are a sub-surface trout food.